Photo: David Aikens Farmhouse, ca. 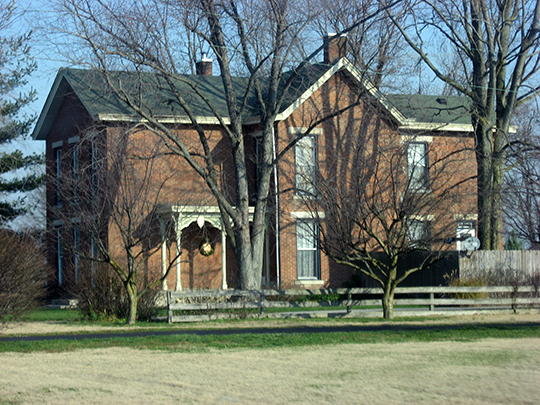 1877, 2325 Jonesville Road (State Road 11) south of Columbus in Columbus Township, Bartholomew County, Indiana. Listed on the National Register of Historic Places in 1978. Photographed by User:Nyttend (own work), 2011, [cc0-by-1.0 (creativecommons.org/publicdomain/zero/1.0/deed.en], via Wikimedia Commons, accessed January, 2013. The Bartholomew County Courthouse is located at 234 Washington Street, Columbus, IN 47201; phone: 812-379-1610. Named for General Joseph Bartholomew [1766-1840], the county was created in 1821. When the county seat was established in 1821, it was named Tiptonia in honor of John Tipton, at his request, in consideration of land he donated for county buildings. The decision was reversed quickly however, choosing the name Columbus (to honor Christopher Columbus) which was favored by the founding politicians.